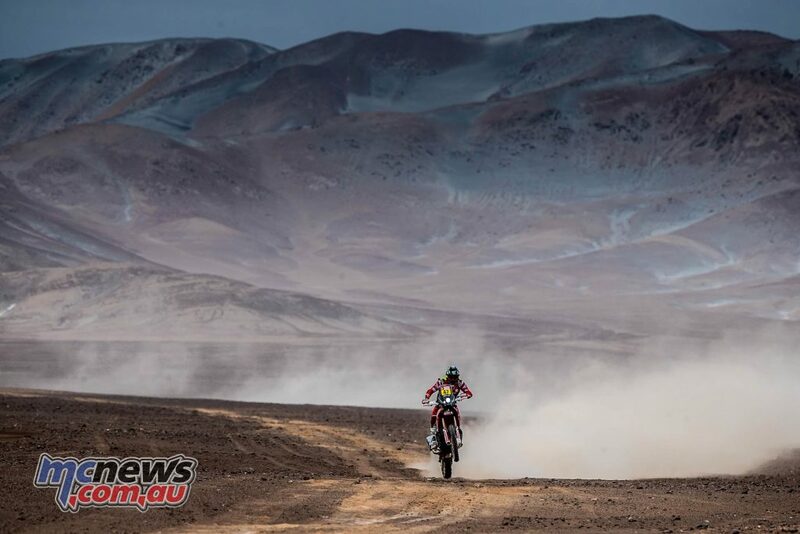 Today saw the first leg of the marathon stage at the 2019 Dakar en route from Arequipa to Moquegua, where the 124 remaining motorcycle riders had an early start to cover the opening 85-kilometre link section before the first part of the 205-kilometre special. The day was soured by biting cold and humidity in both the city and the mountainous regions. The special consisted of soft dunes with many areas of dusty Fesh-Fesh leading into faster, hard-packed river beds. Riders had to take care to preserve their tyres on the faster sections while not losing too much time to their rivals. A short liaison then brought the riders to the temporary bivouac situated near Moquegua. As the marathon stage rules state, riders receive no outside assistance overnight. All maintenance must be carried out by themselves or fellow competitors. Nonetheless, Honda’s Ricky Brabec set off like a bat out of hell, marking the best time in the process. After a neutralisation of 54 kilometres, the second part of the special, over 146 kilometres, proved even better for the American, who cruised home with a six-minute advantage over the nearest finisher, dethroning the previous overall leader Pablo Quintanilla with a walloping twenty minute gap. In doing so, Brabec triumphs for the second time in a stage after the victory in 2017 on the La Paz-Uyuni stage. The American takes the head of the overall rankings for the first time in the world’s toughest rally. 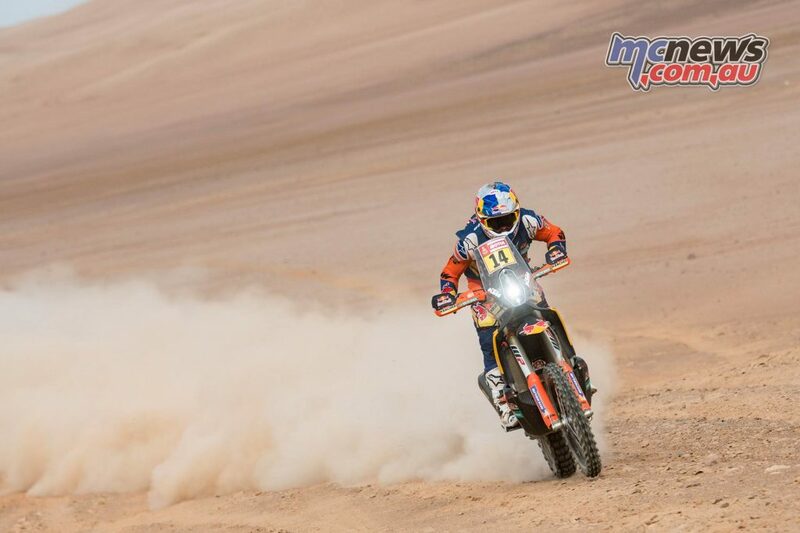 Following his challenging stage three, Matthias Walkner was the 15th rider to enter the day’s timed special. 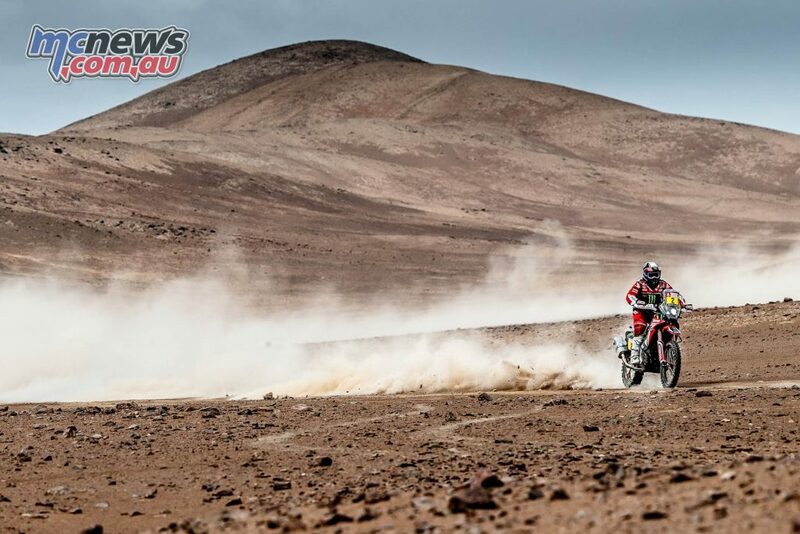 Immediately pushing hard and making the most of his experience to catch and pass riders ahead of him, the 2018 Dakar Champion maintained his strong pace throughout the day on the fast, treacherous route. A heavy landing from one drop-off caused Walkner to hurt his ankle slightly but the Austrian rider was able to continue to complete the stage and finish as runner-up. Despite a small crash in the latter half of the special, Toby Price put in a great ride to finish as third fastest, less than a minute down on the hard-charging Walkner. Still nursing his injured wrist, the Australian is looking forward to tomorrow’s slightly shorter stage five. 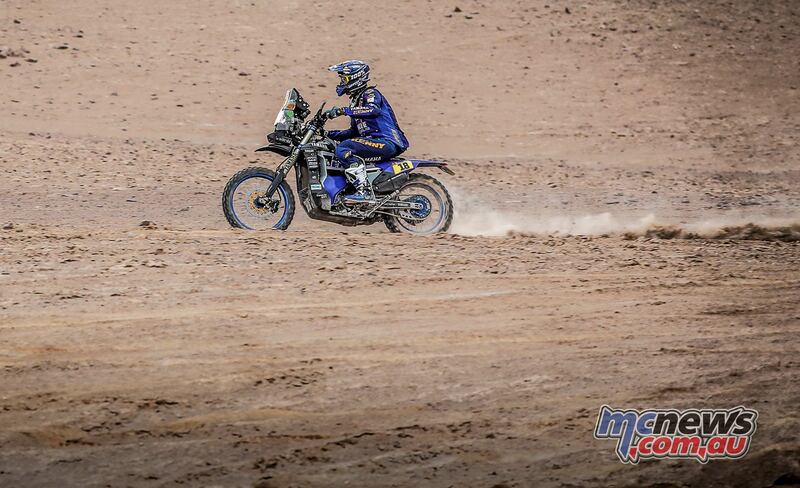 Fifth away at the start of the stage, Sam Sunderland maintained a strong pace throughout the day, despite losing touch with many of the riders ahead of him and navigating his own way through the fast 405-kilometre stage. The British rider ultimately placed fourth and now also lies fourth in the provisional overall standings. Rockstar Energy Husqvarna Factory Racing’s Pablo Quintanilla is holding on to a strong runner-up position in the event’s provisional overall standings. 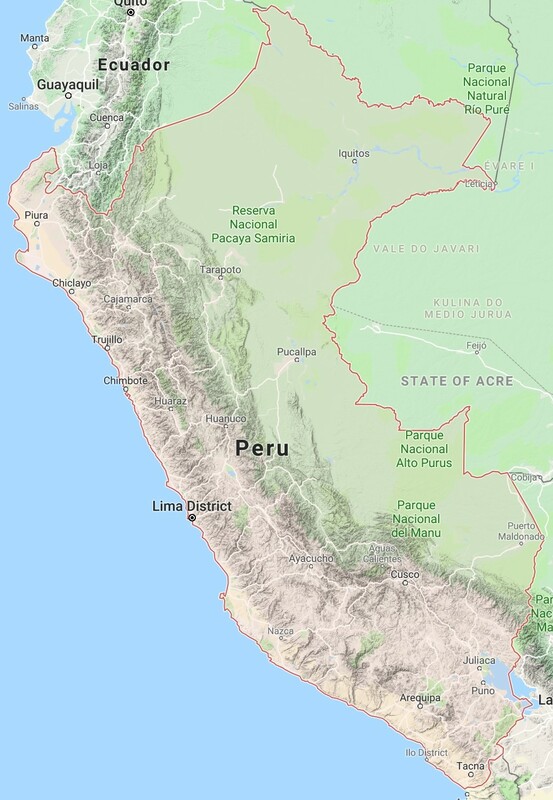 Four days into the 2019 Dakar and the event in Peru has already proven to be a big challenge for all competitors. 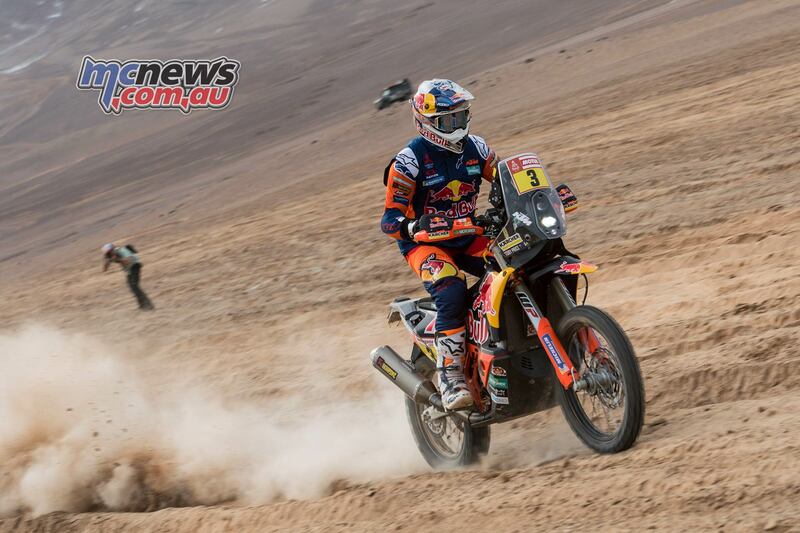 Thursday’s stage four was a fast-paced one that featured many tricky navigational challenges. Racing without the pressure of the opening stages, Yamaha’s Adrien Van Beveren remained fast and consistent from start to finish. Posting the fifth quickest time for the day, the WR450F Rally powered rider is now fifth overall and less than nine-minutes behind the provisional overall leader. 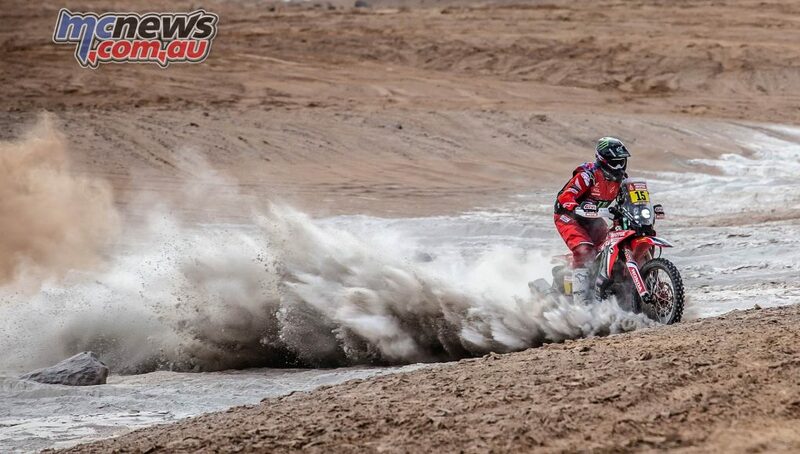 Monster Energy Honda Team’s Paulo Gonçalves continues to improve in the 2019 edition of the Dakar after a spleen operation just a month ago. 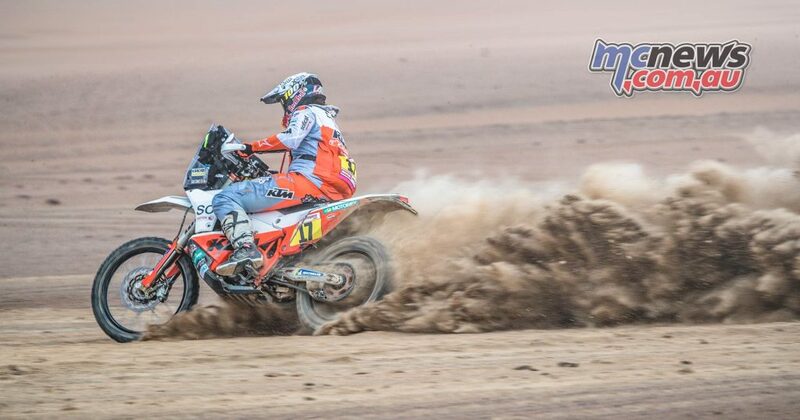 The Portuguese rider finished with the sixth fastest time of the day and lies in eighth in the general standings. Kevin Benavides occupied ninth place at the finish, one spot behind team-mate Nacho Cornejo, with the Argentine now in sixth place overall. 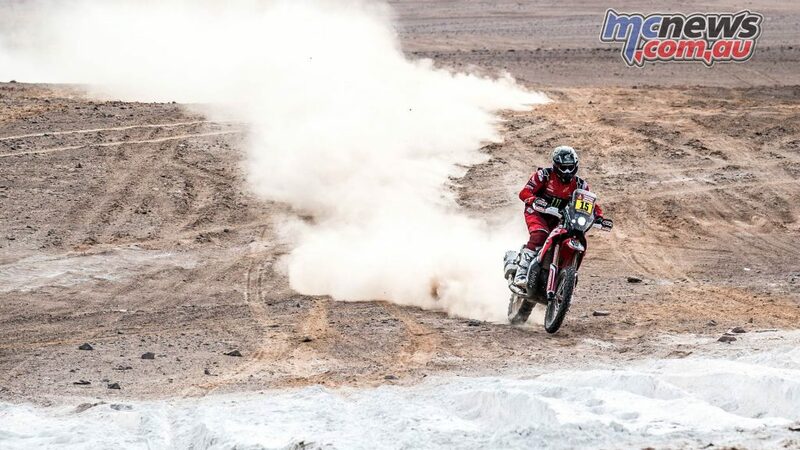 Pablo Quintanilla battled through the day’s tough navigation to post the 14th best time on the special stage but is currently second in the provisional overall standings, two-minutes and 19-seconds behind new provisional overall leader, Ricky Brabec. 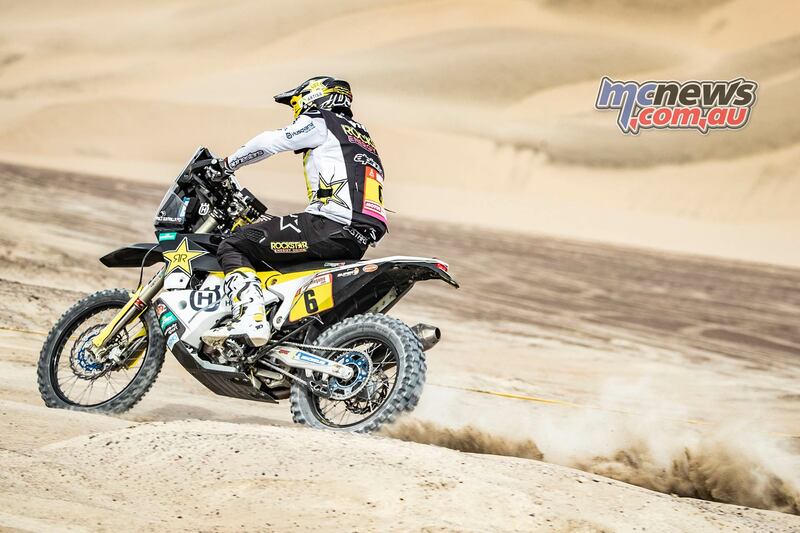 After winning Wednesday’s stage three, Xavier de Soultrait had the demanding task of opening the stage for all following competitors and earned a 15th place result on stage four. Xavier is now ninth and the second Yamaha powered rider inside the top 10 in the provisional overall standings. Experienced Dakar racer Laia Sanz knows the importance of caring for your bike on the first half of the marathon stage. Putting in another solid ride, Laia once again finished the day inside the top-20 as 19th fastest. Queensland’s Rodney Faggotter was forced to retire with technical problems earlier in the rally. Competitors spend the night at Moquegua camp where they can rest and prepare the second leg of the marathon stage. The riders will, however, be left to their own devices as no outside mechanical assistance is permitted. Instead any technical help will have to wait until the close of tomorrow’s stage back at the Arequipa bivouac. The fifth stage will add a total of 776 kilometres to the 1109 disputed so far and will include 345 kilometres against the clock. 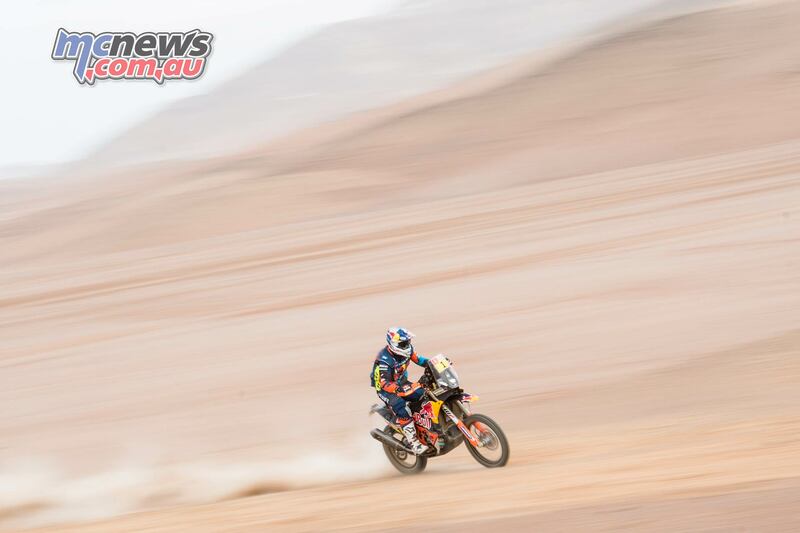 Dakar 2019 Stage Eight | Price hits the lead! | Brabec out!